For a city on the water, there aren’t enough seafood restaurants in Boston that are worth bragging about. Neptune Oyster, obviously. Island Creek Oyster Bar, of course. Union Oyster House, sure. Are you sensing a trend? It was time for a change, for someone to really make a new statement in the seafood world. Enter Ostra! Part of the Columbus Hospitality Group, Ostra joins Mistral, Sorellina, Mooo…, Teatro, and Burlington’s L’Andana as the newest addition to Chef Jamie Mammano’s impressive resume. 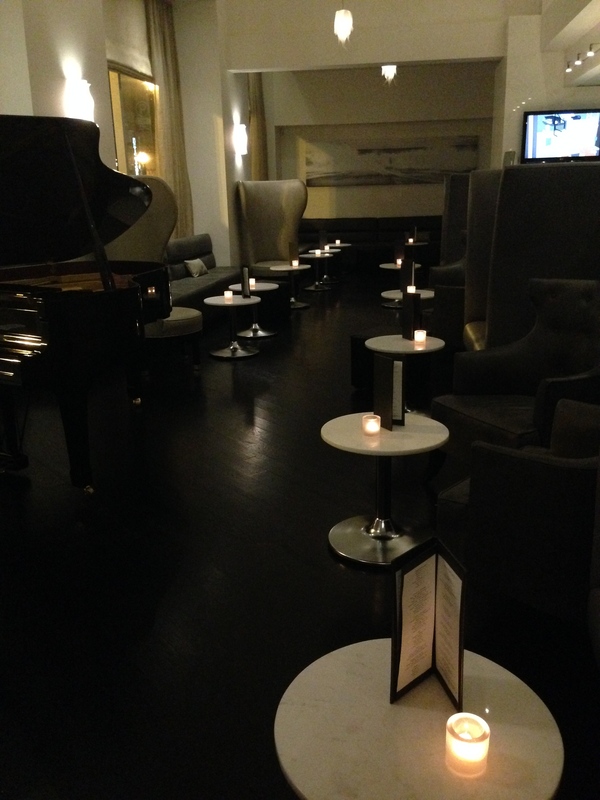 Following in the footsteps of his previous restaurants – excluding the casual Teatro – Ostra is an upscale, fine-dining establishment, with top-notch service, a sophisticated and elegant atmosphere, serving high quality food with sky-high prices to match. 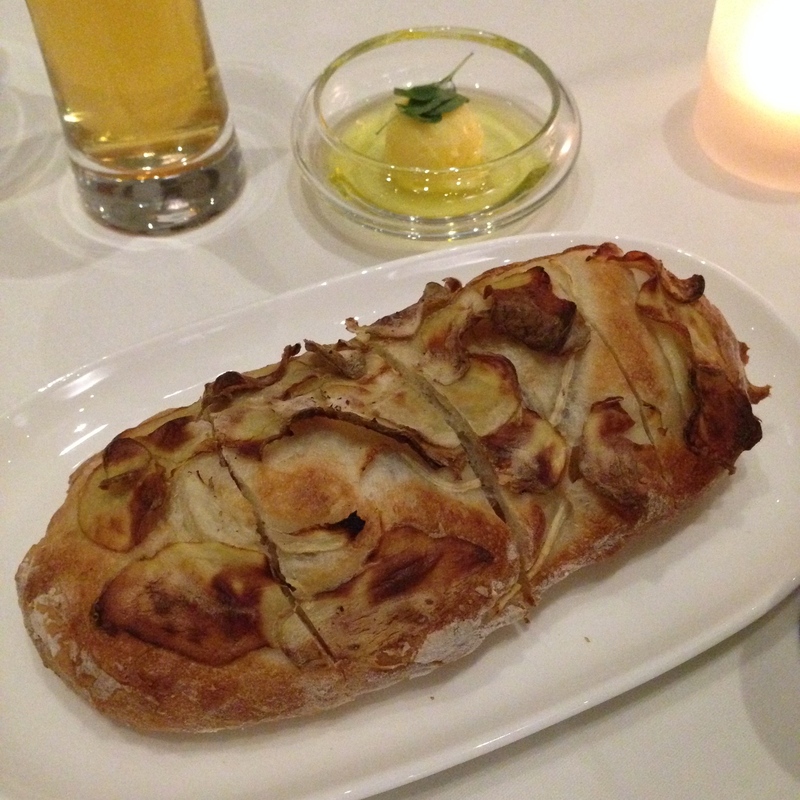 Fingerling potato and onion ciabatta bread was served with a side of softened butter sitting in a shallow pool of EVOO. Slightly warm, pre-cut and easy to tear; we were not disappointed when they brought us another loaf after we devoured the first. I started by splitting a “salad”: Crisp Snow Pea, Sunchoke, Watermelon Radish, Sunflower Sprouts, Bianco Sardo Champagne Vinaigrette. I put salad in quotes because there’s no actual lettuce or greens. 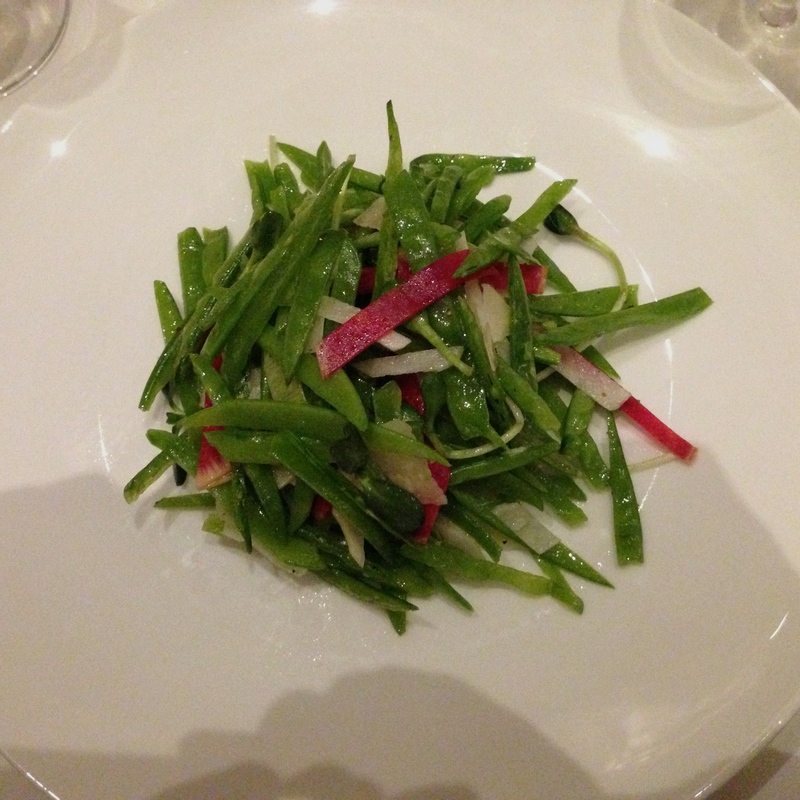 This is strictly a plate of crunchy lightly dressed vegetables, which was a welcomed change to a typical leafy salad appetizer. 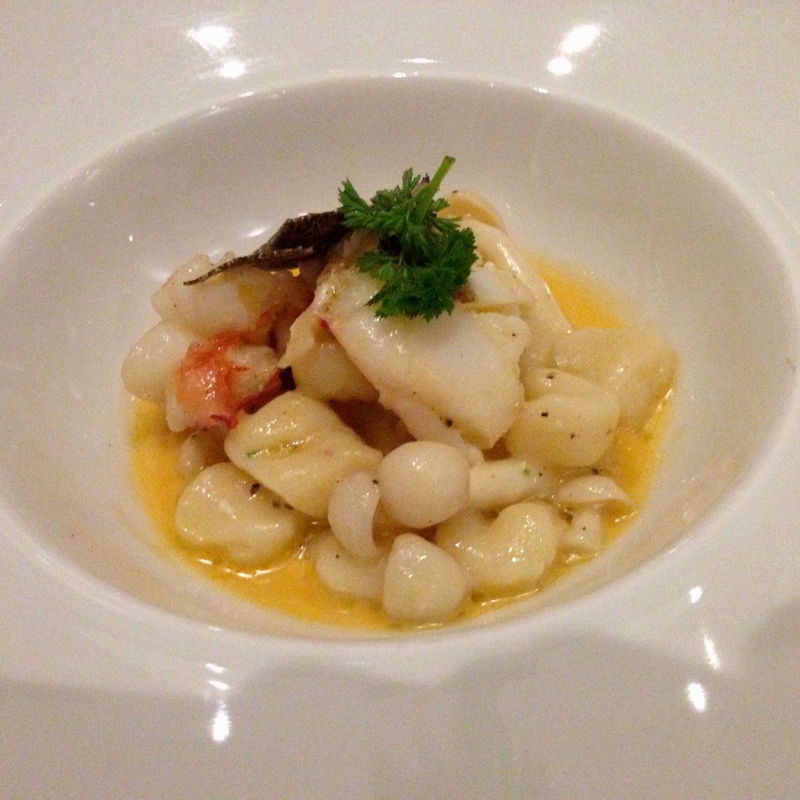 Compliments of the chef, we received a mid-course tasting of Ricotta Gnocchetti, Maine Lobster, Beech Mushrooms, and Truffle. This dish now appears on the menu, and I highly recommend it! With what I’m assuming is house made pasta and large chunks of lobster, you can’t go wrong. 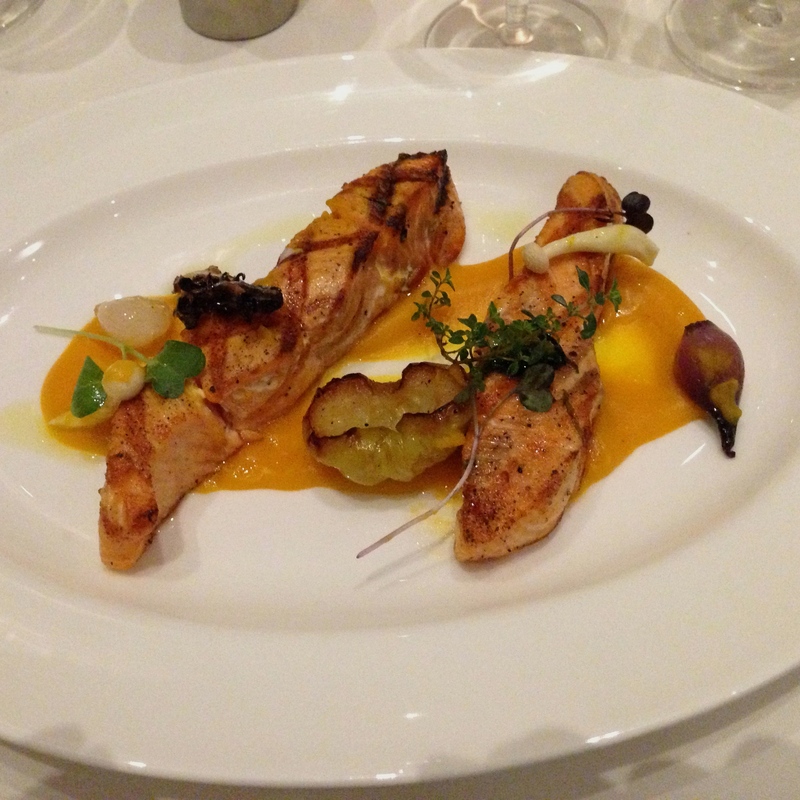 For the main course I ordered the Grilled King Salmon, Heirloom Squash Velouté, Market Vegetable Rôtí. I don’t think I’ve ever seen salmon served in two thin pieces, rather than a single filet. Doesn’t matter to me as long as it’s a decent portion, which this was. Squash puree and grilled vegetables to accompany, my favorite! The Perfect Bite of the evening was hands down the Baked Apple: crumble, cider caramel, brown butter ice cream. This presentation was the most impressive: a thick slice of baked apple sits among the crumble and caramel on the bottom of the plate and is topped with a waffle shaped pie crust-like piece. 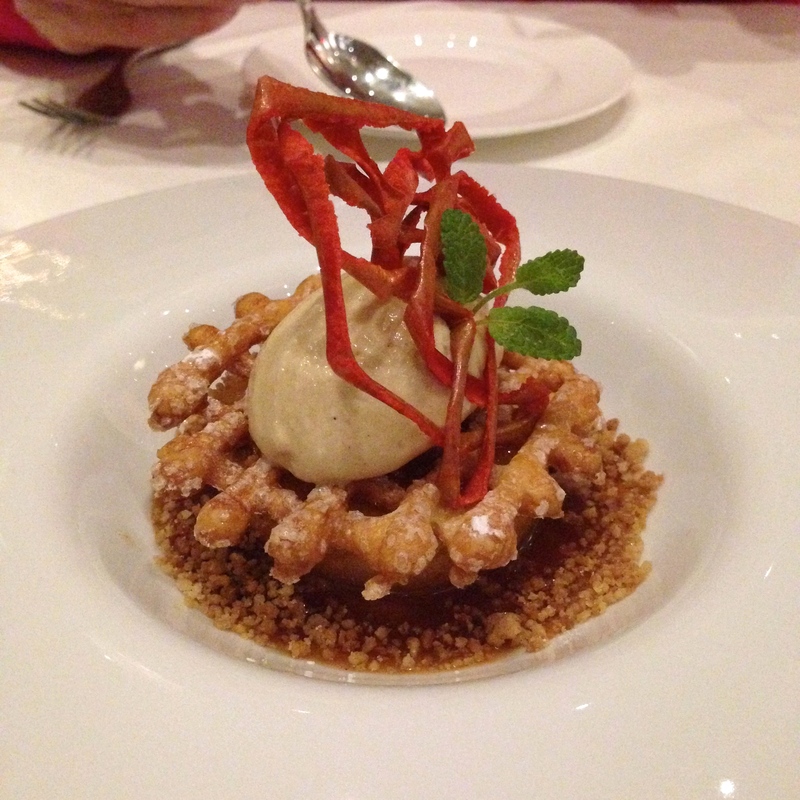 Finish with a dollop of brown butter ice cream and an intricate design of crispy apple skin… and voilà! We ordered 1 for the 4 of us. Big mistake! Ostra is completely stunning; from the lounge (soon to feature nightly live piano music) with its high-backed chairs and booths, to the sleek bar, the fish on ice display, the jellyfish-like chandeliers… everything about Ostra is completely elegant. Even the bathroom is crisp and pristine. The service is of course of fine-dining standards, as are the prices. This was a special occasion meal for me and my family, and I’d go back for another one in a heartbeat.